The Sea Blade 35 is put through its paces on Narragansett Bay, May 29, 2015 (NavatekNEB photo). The Sea Blade 35 (NavatekNEB photo). 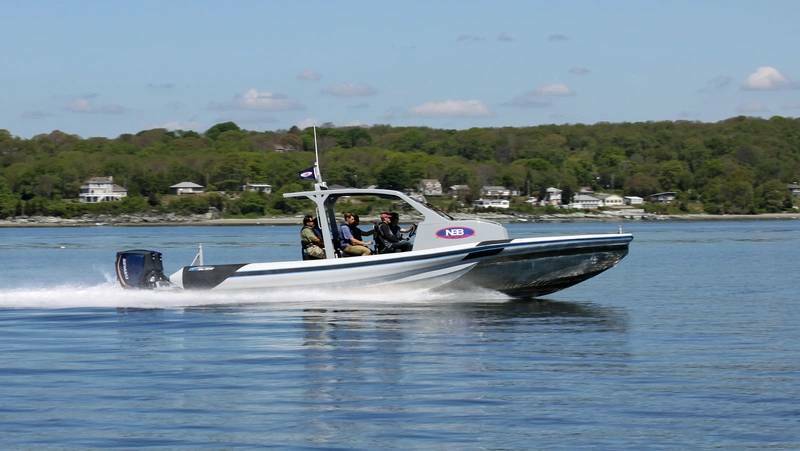 Navatek, the naval research and design company based in Hawaii and Rhode Island, and NEB, a leading builder of high-tech composite and aluminum boats based in Portsmouth, R.I., announce the launching of the Sea Blade 35, a 35-foot rigid hull inflatable boat (RIB) with a top speed of 60 knots. The Sea Blade line of powerboats features a patented hull form designed by Navatek founder and Chairman Steven Loui, a native of Hawaii. The stabilized monohull design has a slender center hull with two stabilizing amas, which form entrapment tunnels between the main hull and amas. Hull panels of 0 or +50-degree deadrise are arranged in longitudinal steps starting with a pad keel. This unique design provides greatly improved comfort and safety in challenging ocean conditions, such as experienced in Hawaii. The Sea Blade 35 hull and deck are built entirely of aluminum, and it’s powered by twin 300hp outboard engines. 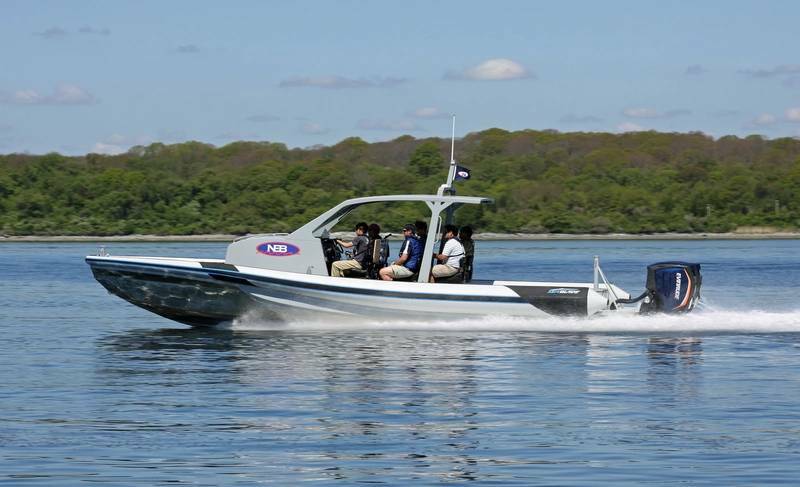 It has a cruise speed of 35 knots and top speed of 60 knots, making it ideal for use as a tender for a professional sailing team or as an umpire’s boat to judge racing. The Sea Blade design provides a measured 20- to 40-percent softer ride than other hull forms and the added stability from the amas makes the Sea Blade 35 ideal as a water taxi or high-speed charter boat running along scenic coastlines. The Sea Blade’s impressive seakeeping characteristics are due to the way the steps, risers and amas work together to progressively slow the boat on impact and spread the energy over a longer time rather than a sharp peak. The Sea Blade 35 is the third collaboration between Navatek and NEB, the Rhode Island-based boat builder that has produced America’s Cup Class and Volvo Ocean Race yachts in addition to cabin cruisers and one-offs. Previous collaborations include the Sea Blade 24 and a wind tunnel for R&D at Navatek’s Rhode Island facility. The Sea Blade 35 and smaller Sea Blade 22 will be used in support of New England regattas in the coming month, including the New York Yacht Club Annual Regatta, the J/111 World Championship, the Storm Trysail Club’s Block Island Race Week and the Transatlantic Race.